Richard Paul Evans wrote a hugely successful Christmas story called The Christmas Box and Hallmark followed with a sweet Christmas movie. The story is that of a cash-strapped family who are caregivers in an apartment complex. They are given the opportunity to move to a local mansion and be the caregivers of the home as well as assume the responsibilities of looking after the owner, a lady named Mary, who lives alone in the house. Mother and daughter quickly become close to Mary but the husband, who works long hours, struggles to get along with her. Eventually, however, Mary teaches him some important secrets about the true meaning of Christmas. 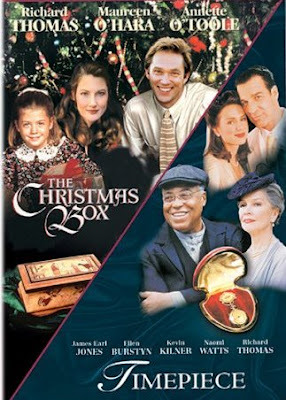 The Christmas Box is a 1995 Hallmark movie with an all-star cast which includes starred Richard Thomas, Maureen O'Hara and Annette O'Toole. For the longest time available only on VHS videotape, this movie is now available as a part of a 2-DVD set that includes both The Christmas Box and Timepiece. Timepiece is a prequel to The Christmas Box. You can find either the VHS tape or the DVD on Amazon by clicking right here. Buying the set may save you a few dollars but, more important, is the fact that the set is on DVD rather than VHS videotape. If you enjoy Hallmark movies, I think you will enjoy The Christmas Box. I have yet to see Timepiece though I have read that it is a darker story. If you have seen it, be sure to let us all know what you thought of it. Buy The Christmas Box on Amazon.